A Korean actor and singer, Jang Keun Suk (28), who has changed his record company from PONYCANYO to UNIVERSAL MUSIC, is going to release a new single ‘Darling Darling / Dry Kiss’ on August 10th for the first time in 5 years. Different from his previous rock tunes, the new song is sweet pop music and he tried his first dancing as a solo singer. When he was filming the MV in the suburbs of Seoul, we ‘Daily Sports’ did his exclusive interview. Jang Keun Suk told us “I tried to express images my fans have toward me. My chapter 2 will begin with this song”. 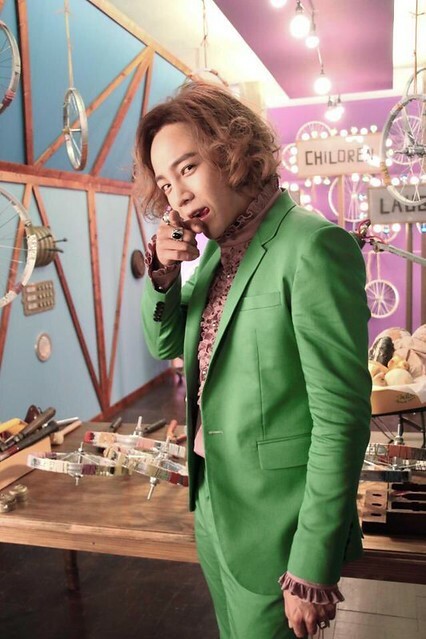 For his fans, for his goal to conquer the world as World Prince, Geun-chan will transform himself to grown-up Keun Suk. The first single after the transfer of his record company, ‘Darling Darling’ is a bouncy tune with sweet lyrics such as “That’s unfair that you stroke my head gently” “I want to be around you longer”. He even shows a relaxing dance with dancers in the MV. The impression we get from is totally different from his previous hard-rock guitar sounds. “The previous songs were my favorite style of music. I did what I want to do so far, but I chose a lovely song this time, considering my fans’ request to correspond with my images they have toward me.” It may sound he compromises, but he calls it ‘responsibility’. “I will be more mature before my 30s.” Not being self-satisfied, he’s trying to think a great deal of viewpoint of his fans. In 2011, JKS made his debut as a singer in Japan. In November of the same year, he held a concert at Tokyo dome. As in the example, his popularity exploded. However, because of strained relations between South Korea and Japan, his appearance in Japanese media has been decreased since then. Still, JKS believes that cultural power is stronger than politics. And he decided to transfer to a new record company that makes him possible to develop his field globally to start his new chapter. With the new single, JKS is going to hold concerts at Yoyogi 1st Gymnasium, Tokyo on July 5 and 6, and at Osaka-Jo Hall on July 19 and 20, and show his new performance to fans. “My darling eels, I always miss you. Can I love you more? When I ask so, you’ll answer me ‘Why not?’ Right?” He will speak to fans in a do-S way then. I love our DoS Master! Hope we get to hear his new single during Endless Summer and watch him dance! My darling prince, we love u a lot more <3 <3.. Thanku for this article. It seems like a love story between us and our prince.. He mentioned his fans everytime.. Coming to dance, suk should have actually given a lot more chance earlier. He does very difficult steps very smoothly. Even my brother has become a fan of JKS dance.. We together have watched daalcom's dancing prince collection video more than 10 times.. But till date we have seen his full song dance in only Oh My Lady.. Hope i can watch this MV soon.. Very excited to watch some new colours of our prince. He’s worked so unrelentingly hard this entire year, and he still has endless ideas for re-inventing himself. I was concerned that he’d feel the need to tone himself down because he keeps saying he’ll show us a more mature Suk, but these photos look delightfully goofy! Don’t you love how fearless he is?! giving them the corresponding credits. I hope your answer thanks. Yay! Jang Keun Suk fighting! I can’t wait to hear his new music! Also to go on youtube and be able to see his MV’s instead of PONY CANYON’s disappointing “video is not available in your country.” Maybe if americans can view his MV’S he’ll gain more popularity here. Hi everyone I am getting more excited ,bcx tomorrow is going to Tokyo and will see his show on the 5th and most proper ably will hear his new songs and see him dance . Thx Tensi for the translations but really hope that he can speak a little of English instead of all Japanese during his shows ,we will enjoy more and understand what he is talking about ,but anyway watching him and to hear his songs is the only reason we go to Tokyo ,right !! Wishing all the success JKS ! See you soon !! As I read this article again, I find that I’m a little confused. Is he saying that if he satisfies himself, he doesn’t satisfy his fans? I hope that isn’t how he’s feeling these days, because one of the things we love the most about him is that he’s so true to himself.